AVANI Atrium Bangkok is a relaxing oasis in Thailand’s busy capital. 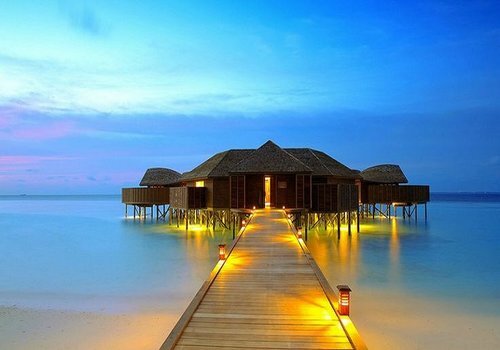 Take a well-deserved break. Get down to business. Give in to your shopaholic streak. 2>Follow Route 7 and the Si Rat Expressway to Bangkapi. Take Exit 2-01 from the Si Rat Expressway. 3>Take tendering Diamond Road to Road / New Petchburi Road. 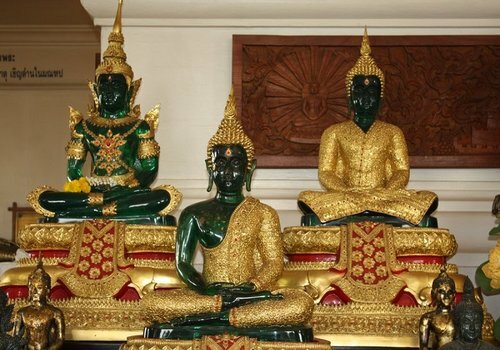 Bangkok, Thailand’s capital is a large city known for ornate shrines and vibrant street life. The boat-filled Chao Phraya River feeds its network of canals, flowing past the Rattanakosin royal district, home to opulent Grand Palace and its sacred Wat Phra Kaew Temple. 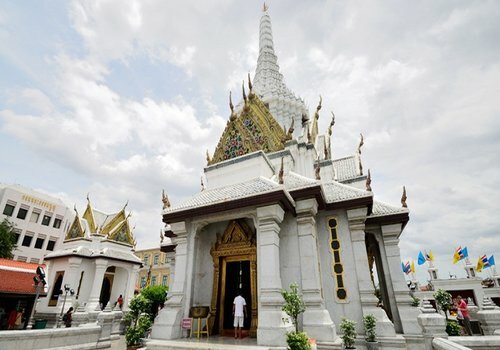 Nearby is Wat Pho Temple with an enormous reclining Buddha and, on the opposite shore, Wat Arun Temple with its steep steps and Khmer-style spire. The city of Bangkok has a population of 8,280,925 according to the 2010 census, or 12.6 percent of the national population. [However, there are only 5,692,284 registered residents, belonging to 2,672,423 households. A large number of Bangkok's daytime population commutes from surrounding provinces in the Bangkok Metropolitan Region, the total population of which is 14,565,547. 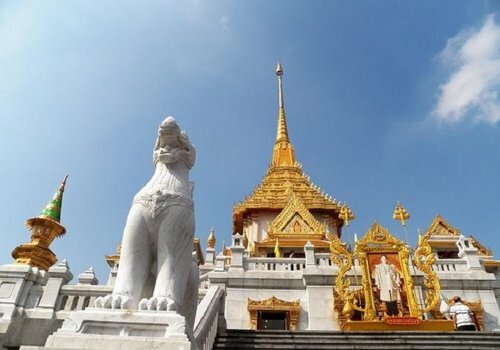 Bangkok is a cosmopolitan city; the census showed that it is home to 81,570 Japanese and 55,893 Chinese nationals, as well as 117,071 expatriates from other Asian countries, 48,341 from Europe, 23,418 from the Americas, 5,289 from Australia and 3,022 from Africa. Immigrants from neighbouring countries include 303,595 Burmese, 63,438 Cambodians and 18,126 Lao. 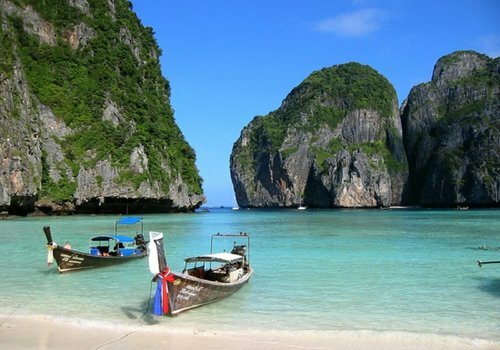 Thailand is a wondrous kingdom with featuring Buddhist temples, exotic wildlife, and spectacular islands. 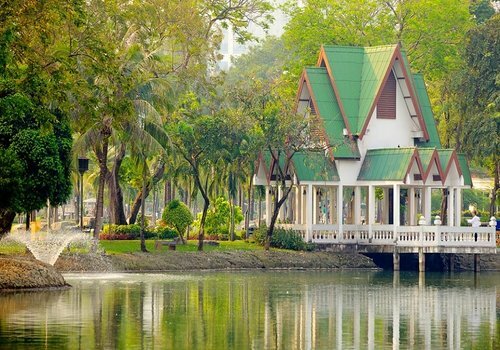 Along with a fascinating history and a unique culture that includes delectable Thai food and massage, Thailand features a modern capital city, and friendly people who epitomize Thailand’s “land of smiles” reputation. As the political, economic, cultural, culinary, and spiritual capital of Thailand, Bangkok features both old-world charm and modern convenience, at times served up in an apparently chaotic manner, but always with a gracious smile. Like most of Thailand, Bangkok has a tropical savanna climate under the Köppen climate classification and is under the influence of the South Asian monsoon system. It experiences three seasons, hot, rainy and cool, although temperatures are fairly hot year-round, ranging from an average low of 22.0 °C (71.6 °F) in December to an average high of 35.4 °C (95.7 °F) in April. The rainy season begins with the arrival of the southwest monsoon around mid-May. September is the wettest month, with an average rainfall of 334.3 millimetres (13.16 in). The rainy season lasts until October, when the dry and cool northeast monsoon takes over until February. The hot season is generally dry, but also sees occasional summer storms.The surface magnitude of Bangkok's urban heat island has been measured at 2.5 °C (4.5 °F) during the day and 8.0 °C (14 °F) at night. The highest recorded temperature of Bangkok metropolis was 40.0 °C (104.0 °F) in April 1979, and the lowest recorded temperature was 9.9 °C (49.8 °F) in January 1955.